(Bloomberg) -- A former Barclays Plc executive joked that Qatar’s Prime Minister might execute him if a 2 billion-pound ($2.6 billion) investment in the bank left the Gulf nation with a bigger slice of the lender than it had bargained for. The revelation at a London trial was another look at the gallows humor of Barclays leadership as they fought to line up financing that would save the bank from a government bailout at the height of the 2008 financial crisis. Four former executives are accused of hiding fees from other investors that were used to coax Qatar to back the ailing lender. Prosecutors played jurors a recording of a phone call between Roger Jenkins, who was the bank’s Middle East head, and Richard Boath, another executive, where they fretted about what could happen if nothing was done to reduce the stake Qatar had acquired in Barclays the previous month. Qatar’s then-Prime Minister Sheikh Hamad Bin Jassim Al Thani had agreed to invest in Barclays, because of the fees and an expectation that other investors would buy most of the shares, Jenkins said on the call. In the end, Qatar and Sheikh Hamad ended up with nearly 10 percent of the bank, he said. Jenkins said he’d go and see Sheikh Hamad at his home in the south of France to discuss the situation and suggested that Boath come too. “Normally there’s one execution," Jenkins joked. "Normally he won’t kill two people. So I’ll send you there. I’ll turn up an hour later." 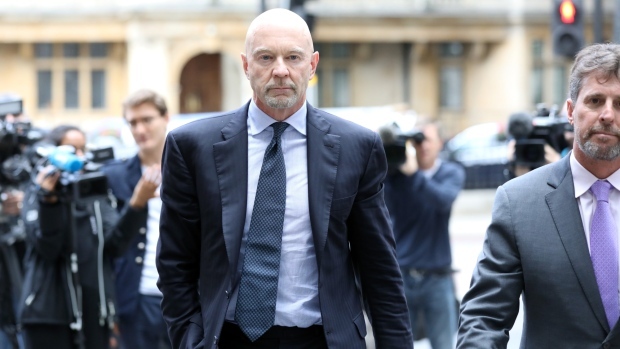 The trial is the first in the U.K. of senior bankers related to the financial crisis. Former Chief Executive Officer John Varley is charged alongside Jenkins and Boath. They all deny the charges. Jenkins, who had secured the Qatari investment, told Boath that he’d already been speaking with Sheikh Hamad and his officials and that they had told him they’d be asking him resign and represent them as a Barclays board member. "You got us into this mess so you resign and take our board seat," Jenkins said, citing the Qataris. "Just between us girls, Hamad is lining up an idea where he’s setting up a little business." Jenkins dubbed the planned fund the “battered banks basket,” which included Qatar’s stakes in BNP Paribas SA, Credit Suisse Group AG and Barclays. After a lull in the conversation, Jenkins started up again: "Out of adversity breeds opportunity," drawing a laugh from Boath, who responded: "I love your optimism." "Because at the end of the day I don’t give a f--k," Jenkins said. "You know, so what."